Your security depends upon having a well trained security guard who is vigilant, reliable, able to solve problems, and equipped with the technology and tools required to maintain your peace of mind. 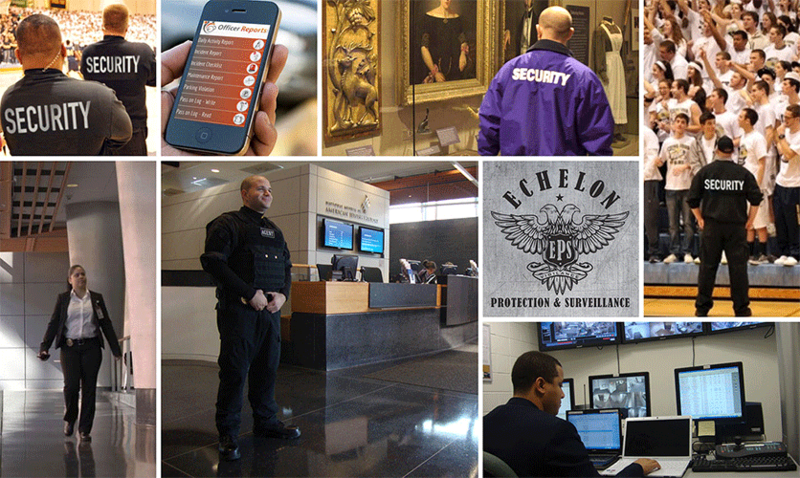 At Echelon Protection & Surveillance, we can develop a customized security plan that meets your needs using certified armed and unarmed Atlantic City security guards. In today’s uncertain world, a professional security guard must be more than a just a person in a uniform – They must also ensure the protection of your property and personnel. Our Atlantic City armed and security guards, and Atlantic City unarmed security guards, must meet stringent qualifications to be a part of our team. 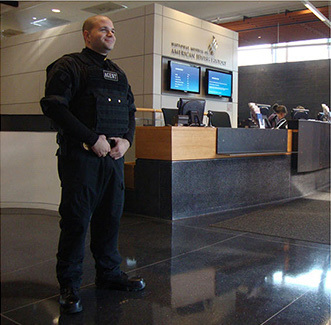 Atlantic City Unarmed Security Guards From education facilities to personal protection, there are a number of situations where Atlantic City unarmed security guards are required. We offer quick, affordable, and reliable solutions for any situation requiring highly-trained Atlantic City unarmed security guards. Atlantic City Armed Security Guards The volatile nature of our modern world sometimes demands Atlantic City armed security guards to ensure the safety and protection of both people and property. Our Atlantic City armed security guards are trained by law enforcement experts, which makes them ideally suited for situations requiring immediate response. Contact Echelon Protection & Surveillance and let us help you develop a security plan focused on meeting your specific needs with both unarmed and armed Atlantic City security guards you can implicitly trust. Atlantic City, New Jersey is a resort community that is located close to southern edge of New Jersey. During the 1970’s, gambling was legalized in Atlantic City. Casino gambling in Atlantic City is a $3 billion industry, as a gambling destination in the United States is second only to Las Vegas. Atlantic City is a small community, unlike Las Vegas. The population of Atlantic City is something less than 40,000 people. However, it has reputation of a resort city. The casinos are located on the historic boardwalk, which stretches next to four miles of the Jersey shore. Every year, some 26 million people visit Atlantic City, arriving primarily by automobile from nearby New York and Pennsylvania, although routes via railroad and airplane are also available. However, long before gambling was legalized Atlantic City was a resort community. During the 1920’s, when federal law made both alcohol and gambling illegal, the golden age if the city was born. The history of Atlantic City is more than boxing matches, beauty pageants, and Donald Trump. It’s a look at the worst and best about the 1900’s. Benjamin Franklin described the piece of property that is occupied by Atlantic City a keg that was tapped at either end. He referred to South Jersey being located between Philadelphia on the west and New York City on the north. However, it is also located between the Atlantic Ocean on its immediate eastern edge, and the Delaware River on the west, with many different swampy tributaries that nearly run through downtown Atlantic City. Atlantic City is also in the center of a region of Jersey that has a heavy cultural influence of Philadelphia. The remainder of new Jersey tends to be influenced by New York City. The people who consider this portion New Jersey their home is distinguishable from other residents of New Jersey by their accent, which is considerably more Philadelphia than Manhattan. People are missing out if they have never been in this part of the nation. This part of New Jersey is beautiful. The coastline that is located to the south of the boardwalk in Atlantic City offers pure white sand, warm ocean water for surfing and swimming five months out of the year. There is also some incredible hobby and sport fishing available. The reason that New Jersey is known as the garden state is primarily because of the fertile soil in the southern and central stretches of New Jersey. This region of the nation produces amazing tomatoes, vegetables, and fruits with tomatoes being the most popular. South Jersey was originally a Quaker commonwealth, and was the population hub of what is currently known as New Jersey, which has remained mostly populated since the 1600’s. These days, the combined population of some eight counties that make up South Jersey is approximately 2.5 million people. This part of the nation is the home of a diverse group of Americans, far from the caricatures that are presented in popular culture by shows that include The Jersey Shore. There are many different things to do and see rather than lounging on the beach, and there is also a strong educational system. As far back as the middle 19th century, the natural beauty in this part of New Jersey was recognized as a possible resort destination. The Belloe House was the first resort hotel in the region and was constructed prior to the establishment of Atlantic City. The year 1854 brought the official incorporation of Atlantic City. This action carved sections of Atlantic City from close by Galloway and the Township of Egg Harbor. The Father of Atlantic City is considered to be a doctor named Jonathan Pitney He was a native of South Jersey and a physician who believed that where most of Atlantic City is located on Absecon Island was the near perfect location for what he considered his medical retreat. Dr. Pitney and his business partners proposed the establishment of his medical retreat to some railroad executives in Philadelphia who believed that his idea that the sea air and salt water offered curative properties. When the Camden and Atlantic Railroad, which hugged the edge of the bay at the rim of Atlantic City, and connected Philadelphia with the small resort community was completed, a local phenomenon called Atlantic City was created. Within the next 20 years, the opening of new attractions and increased access to the area attracted some 500,000 additional tourists to Atlantic City. Soon, local hotels and other resort properties were making money like nowhere else in the nation. For many years, the United States Hotel that was developed in order to serve the throngs of new tourists who wanted medical treatment on Absecon Island, was the grandest and largest hotel in the nation. It wasn’t long before Hotel owners established the very first boardwalk simply to keep the sand from entering their lobbies. The boardwalk eventually reached some seven miles to the edge of the landmass of Jersey. It is still the most recognizable feature of the Atlantic City metropolitan region. There was a large building boom on Absecon Island during the first fifteen years of the 1900’s. Another railroad was added to help transport the visitors who were now arriving in droves to the small community. Massive hotels that provided different kinds of entertainment both illegal and legal began populating the small stretch of the Jersey Shore, one by one. A whole host of vices including the consumption of alcohol went unregulated in Atlantic City for the duration of the prohibition years. During prohibition, Atlantic actually thrived as the result of corruption at practically every level of law enforcement and government. However, the start of WW II and end of Prohibition resulted in a near-disaster for South Jersey and Atlantic City as well. The first great collapse of the economy in Atlantic City occurred at the end of WW II.